The Canon 60Da will be available this month and cost $1499.99. 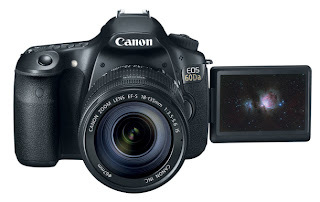 Canon has just announced the long-awaited (6 years!) successor to its legendary 20Da astro cam: the 60Da, which, like its predecessor, is a standard 60D except for its enhanced sensitivity to the hydrogen alpha wavelengths, which make it, hands-down, better than any standard dSLR for capturing the brilliant reds common to deep sky objects. In the following couple of days, expect some commentary either here or on Examiner. For now, if you want some in-depth analysis, go here. Hi. Not in direct relation with this [useful] article, the Examiner website referred here advertises for the JustAnswer service which I nearly used for details on the Canon 60Da, before realizing it could be apparently a massive scam.